German Epic Metal pioneers EQUILIBRIUM will set aflame a new bonfire this summer with their fourth studio album. Guitarist, composer and lyricist René Berthiaume spent almost four years working on the new creation, called“Erdentempel”. The album was recorded, produced and mixed under the direction of René at Helion Studios and mastered atFinnvox-Studios. “Things finally get going again! The new album is done and we can hardly wait to share it with the world. The 12 titles are already a hint that it’s an extremely varied album. I have just listened to the album again, and I’ve never been so happy and excited after the completion of an album. The album really includes every facet of Equilibrium. We are also very proud of the cover artwork of »Erdentempel«. Skadi has been listening to the record most intensely, started to draw and this is the outcome. She really managed to put the content of the album into a picture! By the way, this time there is one song with English lyrics on the album. It is for all our fans who don’t speak German. So they can finally understand the lyircs while listening to it. The other songs are still in German, of course! „Erdentempel“ will be released June 06, 2014 via Nuclear Blast! Equilibrium online játék és verseny! Hot News: Equilibrium – announce video contest for ‘Wirtshaus Gaudi’! Hot News: Equilibrium – Hit The Charts! 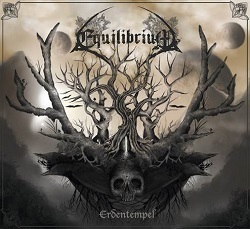 Hot News: Equilibrium – „Erdentempel“ out now! Hot News: Equilibrium – kicking off ‚Heidenfest‘-Tour this week! Hot News: Equilibrium – Announce New EP!